The Generation 6 Corvette incorporates state-of-the-art Chevrolet Racing technologies that deliver superior high-quality performance with enhanced power, spectacular handling and excellent braking. 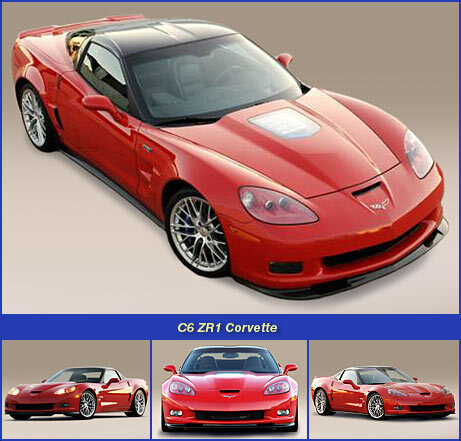 The most powerful and technologically advaned Sixth Generation Corvette is the ZR1 model which was released in 2009 with a supercharged engine ratied ar 638 horsepower and 604 ft-lbs torque. The Sixth Generation Corvette offers several different models that are all Great American Sports Cars. The ZR1 Corvette and the Z06 Corvette are World Class Supercars. The new Corvette also has a high-technology body designed with smaller exterior dimensions that are 5 inches shorter and 1 inch narrower than the C5. A precisely-built and technically-sophisticated interior provides impressive styling and sophisticated quality that offers improved ride comfort. The sixth-generation Corvette also achieves lower vehicle weight, even with the addition of numerous new features. The Corvette Coupe weighs 3179 lbs and the Convertible is also lighter, with a base curb weight of 3,199 pounds, which is 49 pounds less than the 2004 C5 model. The optional power top mechanism adds just 14 pounds to the car’s weight. A new LS2 6.0-liter small-block V-8 is the standard engine in the C6 Corvette and is based on GM’s new Gen IV small-block family of engines. The 364 cid LS2 develops 400 horsepower and 400 ft-lb of torque. It is the largest, most powerful standard small-block engine ever offered in the Corvette. The LS2 engine delivers impressive horsepower and great efficiency, with an extraordinary combination of horsepower and fuel economy making it one of the world’s best all around high performance engines. The remarkable fuel economy is estimated at 18 MPG city and 28 MPG highway with the standard six-speed manual transmission and 17 MPG city & 27 MPG hwy with automatic transmission. This level of fuel efficiency is better than some family car sedans, which is what makes the LS2 engine even more impressive. Major revisions to the manual and automatic transmissions provide Corvette with significant improvements geared towards performance driving. The Tremec six-speed manual gearbox is available with two sets of ratios, one with more aggressive acceleration characteristics reserved for Corvette’s Z51 Performance Package that emulates the performance of the C5’s landmark Z06 model. Improved shifting characteristics are another major improvement, with new synchronizers that reduce travel by 10 percent, and a shifter knob that is an inch shorter and redesigned for greatly improved driver operation. The Hydra-Matic 4L65-E automatic transmission is an upgraded version of the C5’s 4L60-E, strengthened and revised to accommodate the LS2’s 400 lb.-ft. of torque. It includes GM’s advanced Performance Algorithm Shifting, which automatically selects the optimal gear for a given driving condition, making it great for performance driving and hard cornering. The transmission now shifts at higher revs to take advantage of the higher engine output. Rolling Thunderz is dedicated to increasing the level of power & performance for the C6 Corvette’s LS2 engine with sophisticated cylinder head modifications and technologically advanced valve-train components. 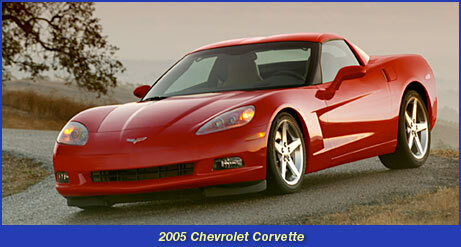 The 2006 Z06 Corvette is the Greatest Corvette ever built. The high performance capabilities of the 2006 Z06 Corvette are exceptionally amazing, which makes this Corvette one of the quickest and fastest supercars of all time. Absolutely Incredible Acceleration from 0-60 mph in 3.7 seconds. Drag Strip Quarter Mile Performance in 11.5 seconds at 127 mph. Very Fast High-Speed Performance with a Top Speed of 198 mph. The new 2006 model Z06 Corvette was designed and engineered after the Corvette C6-R race car, which is what makes this car the most powerful “Naturally Aspirated” Corvette ever produced and the greatest-performance vehicle in the history of General Motors in 2006. The big difference in the body style of the new C6 Z06 from the C5 Z06 is evident in the rear window structure where the new Z06 uses the same fastback rear window design from the C6-R race car, which offers better aerodynamics to improve top speed and fuel efficiency. The new C6-R racecar Corvette competes in the GT1 race class of the American Le Mans Series in North American, with the Chevrolet Corvette Racing team winning its fifth consecutive ALMS Manufacturers Championship in 2005. The Chevrolet Corvette Race team also competes in the "24 Hours of Le Mans" in France. 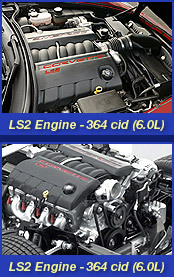 The 2006 Z06 Corvette engine is designated as the LS7 and with a power rating of 505 horsepower at 6200 rpm, it is the most powerful “naturally aspirated” high performance production small block engine ever produced for the Corvette; and the largest displacement small block Chevy ever produced with 427 cubic inches (7 liters). The LS7 engine consist of exotic lightweight racing components, including titanium connecting rods and titanium intake valves which help to produce more power and increase rpm capability. The 2006 Z06 Corvette is equipped with high technology cylinder heads that are designed after the C5-R & C6-R race cylinder heads. The LS7’s high technology cylinder heads are designed to deliver approximately 100 CFM (cubic feet per minute) more intake airflow than the Corvette’s 6.0-liter LS2 V-8 heads and the LS6 heads for the C5 Z06 Corvette. LS7’s heads have large high flow intake ports that are designed to deliver high velocity airflow to provide great low speed torque and high rpm horsepower. The heads feature 70-cc combustion chambers with 2.20 inch-diameter titanium intake valves and 1.61 inch sodium filled exhaust valves. The LS7 valve angles are 12 degrees versus 15 degree valve angles for the LS2 head and the LS6 head for the C5 Z06 Corvette. The LS7 race engineered cylinder heads are the key components for developing the high power output that makes the 2006 Z06 Corvette a high technology street legal race car. Ned Erkman has extensive knowledge of race cylinder head technologies and specializes in high performance cylinder head modification services that develop more power and increase performance. The LS7 Cylinder Heads modified by Ned Erkman flow over 390 CFM of air and Ned’s Z06 Corvette Phase 1 System delivers over 600 horsepower naturally aspirated. The Phase 2 NEDHEAD BN7 Cylinder Head & Camshaft Stealth System, with the stock Z06 exhaust manifolds, produces more horsepower than the Supercharged C6 ZR1 Corvette. The NEDHEAD BN7 Phase 4 and Phase 5 Systems produce over 600 rear wheel horsepower on a top of the line Mustang Dyno AWD-1750-DE model. The NEDHEAD BN7 Phase 4 & 5 Systems produce over 200 more Horsepower and extend the peak power of the LS7 engine by 1000 RPM. 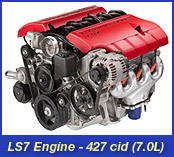 Stock LS7 engine rated 505 HP at 6200 RPM and NEDHEAD BN7 System produces over 750 HP at 7200 RPM with a NEDHEAD Phase 5 Performance Enhanced LS7 Engine. The Chassis Dyno test below demonstrates a 200 Rear Wheel Horsepower increase with maximum horsepower being extended from 6200 RPM to 7200 RPM. Total power increase of 200 RWHP and 1000 RPM. Rolling Thunderz has extensive knowledge of race cylinder head technologies and specializes in high performance cylinder head modification services that develop more power and increase performance. 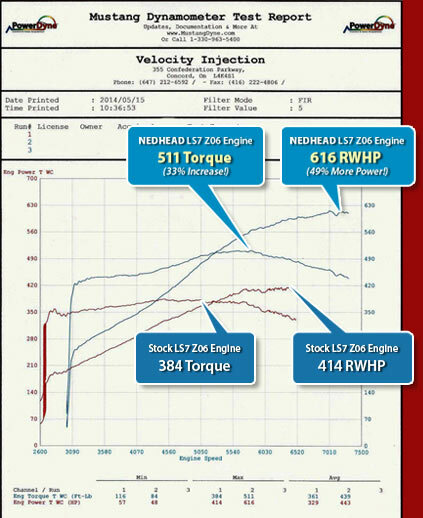 Rolling Thunderz performance enhanced GM LS7 heads flow over 390 cfm and help to produce over 625 engine horsepower and 507 RWHP on Mustang Dynamometer tests. Rolling Thunderz specializes in developing superior LS7 cylinder head modifications for custom performance applications. Custom camshaft designs are also developed with high technology custom camshaft profiles available for street or race applications that are designed to work with Rolling Thunderz cylinder head performance enhancements.